If you're going to run like Tre Mason, you have to wear something good on your feet. We knew Auburn running back Tre Mason was good. He rushed for 1,621 yards and 22 touchdowns this season. He single-handedly destroyed Missouri in the SEC championship game by racking up 304 yards and four TDs on 46 — 46! — carries. He spent much of last week touring New York City and doing interviews as a Heisman Trophy finalist. In a few weeks, we might even be able to call him a national champion. 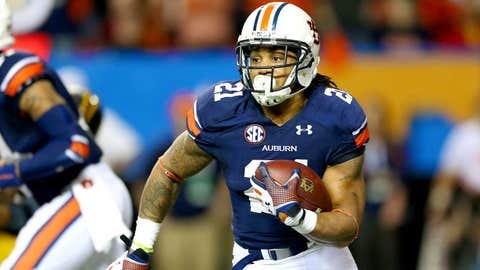 What we didn’t know about Tre Mason? He has incredible stocking game. Somehow, somewhere, Mason got socks made with himself on them, honoring his nod for SEC offensive player of the week. Yes, they are awesome. Look.